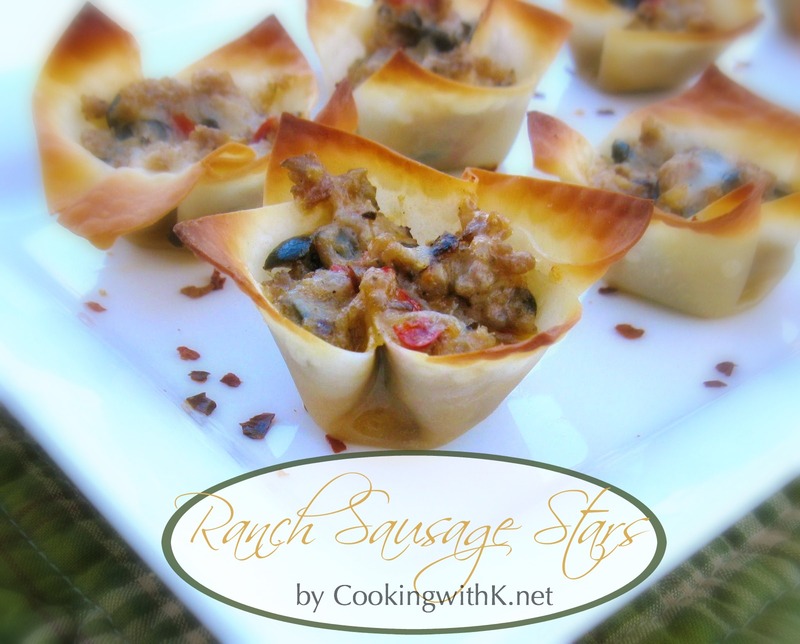 Hidden Valley Ranch Sausage Stars were the main attraction at our New Years Eve Party. I have seen these in many magazines over the years and even cut the recipe out, but never made them. Well, I found out just how much these are amazingly quick and easy to make! You can count on these to be on our table for our Super Bowl Party. To serve a few guest you can make them in a regular size muffin pans, or to serve them as an appetizer like I did, you can make them in mini muffin pans. They hold up well to take somewhere as well as easy to heat up just before you serve them. Preheat oven to 350 degree F. Blot sausage dry with paper towels and combine with cheeses, salad dressing, olives, and red pepper. Lightly grease a mini (or regular) muffin tin and press one wrapper in each cup. Brush with oil. Bake 5 minutes until golden. Remove from tins, place on baking sheet. Fill with sausage mixture. Bake 5 minutes until bubbly. Makes 4 to 5 dozen. Note: Venison sausage works well in this recipe! and he that hath meat, let him do likewise. Fabulous - I'm not surprised these where a great attraction - I could polish a few off right now! 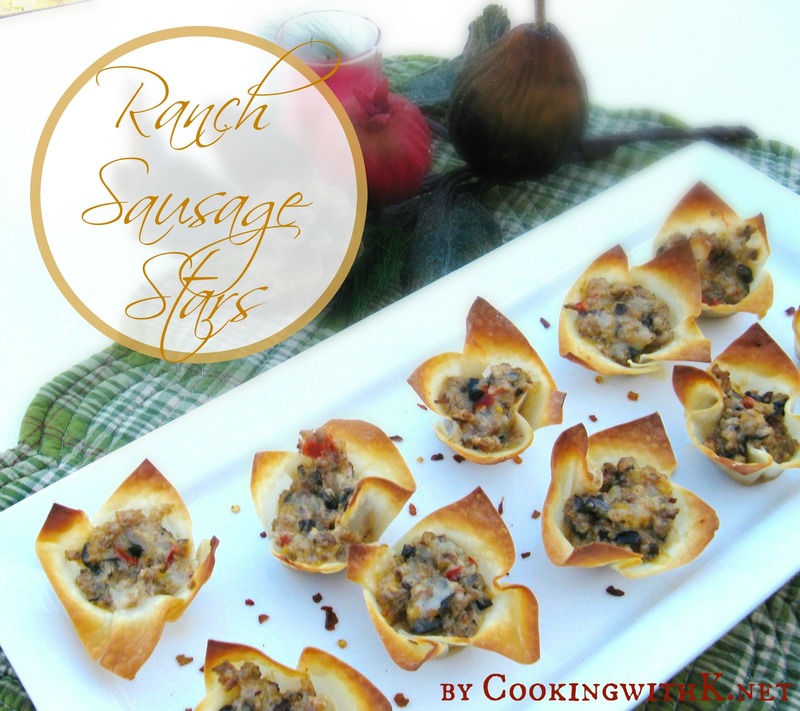 Oh - I love sausage and cheese and ranch dressing mix so, this is a no brainer for me :) Thanks so much for sharing this - I have never seen the recipe before. Can't wait to try it! This looks delicious. My kind of snack! Come visit us. We have a terrific crockpot recipe this week. Looks delicious! Thanks so much for sharing!! I cut this recipe out eons ago, too, and never tried it. It's time! They're beautiful! Thank you kindly for the link back to my blog :) Fun stopping by to visit with you! Love this post! Stop in when you have a chance and link it up in my Happy Friday Dip Link up! I know it isn't a "dip" but yet it is. I'd love to have you! Feel free to link up your other dips, too! Wow that is a perfect appetizer, I am thinking of using it for our super bowl party. Thank you so much for sharing with our 1st Anniversary Party at Full Plate Thursday. Have a great week end and come back soon! These look really good and you're right, very easy! Thanks for sharing them! Those look good! I will have to try them. Thanks for following! I will do the same! I have been browsing around your older posts, and now I am starving! Those look delicious! And very presentable, too. These are such a pretty appetizer and sound so delicious! What a great appetizer! Saw you on country mama cooks. Have a great weekend! Here I am trying to behave myself and you post a recipe like this! It sounds delicious! Perfect for a football party! Thanks for sharing at Church Supper. Have a blessed week, and see you again next Sunday! wow, I am loving this~ can't wait to give this a try. I am afraid I would eat 100 of them. Pinned and stumbled. These are great and I am featuring it, this week, at Bake With Bizzy. Thanks for sharing. You are being featured @CountryMommaCooks Link & Greet Party...Stop by and pick up a featured button......Have a wonderful weekend! These are a hit no matter what type of event I take them to! Everyone thinks you are really a chef with these little gems. No matter where I take these, everyone loves them. They also think you are quite the chef with these little gems. This is a perfect appetizer! Delicious and not overly complicated....my favorite kind.